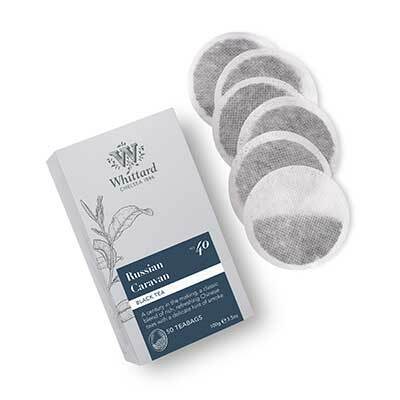 Looking for Russian Caravan Teabags? Russian Caravan takes its name from the camel-drawn caravans which travelled the ancient trade routes through Russia, taking this tea from China to the tea tables of Europe. One of our very first blends, it brings together the rich, malty taste of Assam with the authentic campfire smokiness of Lapsang Souchong from Fujian. We've added high-grown Nepalese tea to balance the smoke-tinged taste with light, bright top notes – all in all, the result is a multi-layered brew with rich, layered tones of spice, sweetness, malt and smoke. It's an old-time classic with a real sense of history. Really enjoyed this tea! It has a nice robust flavour and aroma, smoky with malty undertones. I love drinking this blend during or after dinner; it really seems to compliment various meats and fish. Fully oxidised for a rich, robust flavour, black tea is the most popular type of tea in the western world – and for good reason. Its full body and depth of flavour make many black teas ideal for drinking with a splash of milk, while more delicate varieties like Darjeeling express a huge range of complex characteristics.